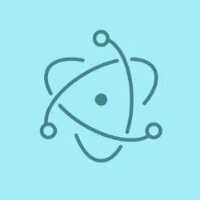 In my last post, I wrote about how to get a basic Electron app up and running. But what do you do if you want a multi-window app? For example, if you want to display various user specific options once you select from the app menu. Let’s see how to get this done. In our main.js file, we add a couple of lines of code to trigger the options window when a user clicks on the options menu. For this we include a module called ipc which enables us to send commands across when an event occurs. So we include the module and add a callback for the options menu. ipc.send('display-options') sends a command display-options (this can be named anything) to the main process when a user clicks on options menu. After this we will modify the app.js file to capture this event. You’ll see that in our exisiting app.js file we have added another browser window instance called optionsWindow and assign it a width and height. We also assign a property show: false to ensure that this window is not diplayed when our main app is loaded. We want the options window to be displayed only when the user clicks on options from the menu dropdown. Here we also catch the command display-options using ipc.on('display-options') method. Within the callback we call the show method on optionsWindow as optionsWindow.show(); to display the options window. 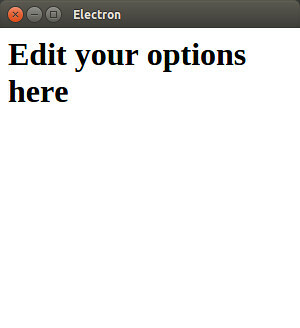 Options window is just another html file. So back in the command line when we run npm start the app window boots up and when we click on the options menu, we see this little window pop up.